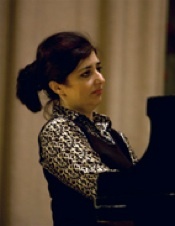 Dr. Aida Huseynova is Associate Professor of Musicology at Baku Music Academy . She has a PhD in musicology from the St. Petersburg Conservatory, Russia. Dr. Huseynova’s main area of expertise is East-West synthesis in musical culture of Azerbaijan. Since 2000, she has been numerously hosted by Indiana University School of Music as a visiting scholar. Dr. Huseynova is the author of more than 90 publications, including four books. She has presented lectures on the history of Azerbaijani music throughout Europe and the US . In 2005, Dr. Huseynova served as the member of the Advisors’ Committee at the Sixth Annual San Francisco World Music Festival. In 2006, she was a “musicologist-in-residence” at the International Festival and Symposium of Contemporary music “Icebreaker III: The Caucasus” held in Seattle. In November 2007, she has been a part of the residency of Yo-Yo Ma and the Silk Road Ensemble at Harvard University. While at Harvard, Dr.Huseynova presented a lecture on Azerbaijani music and gave pre-concert talks at the New College Theater. Currently Aida Huseynova serves as a consultant for the Silk Road Project on the new chamber version of Azerbaijani opera “Leyli and Majnun” by Uzeyir Hajibeyov. Dr. Huseynova has received numerous grants including a fellowship from the Junior Faculty Development Program (2001-02) and the Fulbright Program (2007-08). She is a member of the Composers Union of Azerbaijan and Central Eurasian Studies Society, U.S.A. , Secretary General of the National Music Committee of Azerbaijan.